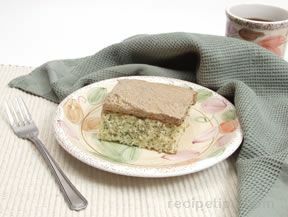 This is a great dessert for coffee and tea parties as well as everyday meals. Soak poppy seeds in amount of water listed on cake mix for at least 2 hours. Mix together cake mix, poppy seeds with water, egg whites, oil, and pudding mix and beat for 2 minutes. For frosting: cook milk and flour until smooth. Beat together butter, crisco, brown sugar, and maple extract for 5 minutes. Add the milk and flour mixture and beat 5 minutes more. Frost cooled cake and enjoy.